Sunday, March 3, 2019, was a typical day spearfishing in Kailua- Kona. Then, I spotted a munu and started chasing it into a cave. As I got closer to the cave, I noticed two big white antennas sticking out. I knew instantly it was a lobster. I noticed the surface of the lobster had distinctive colors different from those I normally find. Before it went deeper into the hole, I quickly rushed to grab the (4-lb 9 oz) lobster. I was the last one to come to shore. 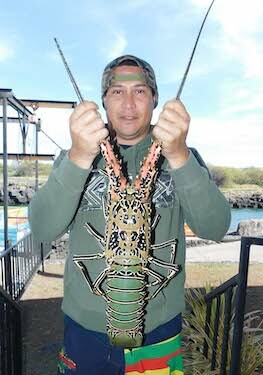 My diving partners were there with enormous smiles on their faces and amazement at this lobster we had never seen before.